Intrade.com, a website where people can bet on such things, currently gives the following likelihoods of each candidate winning the Republican nomination: Rick Perry – 36%, Mitt Romney – 29%, Michelle Bachman – 6%, Jon Huntsman – 7%, everyone else – 22%. I would say those are pretty accurate odds at this point. Those numbers give Romney noticeably poor odds compared to his poll numbers. He is still the frontrunner based on the most recent Gallup poll. However, the Intrade crowd is (smartly) pricing-in other factors, including Romney’s weakness on healthcare and the fact that the public is still learning who Perry is. The Romney campaign should be very concerned. Romney is the kind of candidate who probably needs to lead from wire to wire in order to win. To illustrate why, imagine that both candidates are football teams. Rick Perry is like the Dallas Cowboys of last year. They had a high-powered offense. They had a lot of weapons. They could score points quickly. But they didn’t have much of a defense. They would score points and then make big mistakes that gave those points right back. As a result, they were never out of a game (because they could score points in a hurry) but none of their leads were safe (because they couldn’t stop their opponents from scoring). Rick Perry is fiery, exciting, aggressive and ruthless. He can rack up political points very quickly. So, like the Cowboys, even if he gets behind, he will have a chance to come back and win. However, his defense is questionable. He will probably make mistakes. He might say some stupid things. He might offend some large groups of people. So, he would have to have a very large lead for it to be safe. Mitt Romney is like the Baltimore Ravens. They were the opposite of the Cowboys last year. They had an excellent defense and a poor offense. They wanted to play slow, low scoring, field position football. If they got a ten point lead, they were almost impossible to beat. However, if they got behind by ten points, they had a very tough time coming back. Likewise, Romney has trouble inspiring large groups of people in short periods of time. He wants a slow, boring nomination process. He wants Republicans to look at their primary votes in a cold, rational manner. He wants them to ask themselves which candidate has the best chance to win the general election. 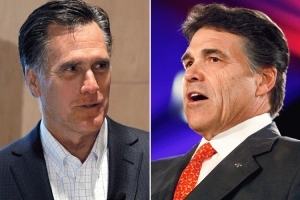 Thus, Romney needs to stay very close to Perry in the polls. Romney will probably not make many mistakes, which will make it difficult for Perry to move noticeably ahead of him in the polls. But once Romney gets behind, he will have a lot of trouble mounting a comeback. At that point, his only hope might be a major mistake by Perry. The Cowboys and Ravens did not play each other in 2010. But, we’ll see how the Perry Cowboys and the Romney Ravens fare against one another over the course of the next year. This entry was posted in 2012 election and tagged 2012 election, football, Mitt Romney, Republican Primaries, Rick Perry. Bookmark the permalink. I would say Ron Paul would be most like the 2010 Lions. Nobody has any respect for him accept a few die-hard fans. He has no chance of really winning anything, but I could see him making a hard charge late in the game after he is already out of it (as the 2010 Lions won their final four games).